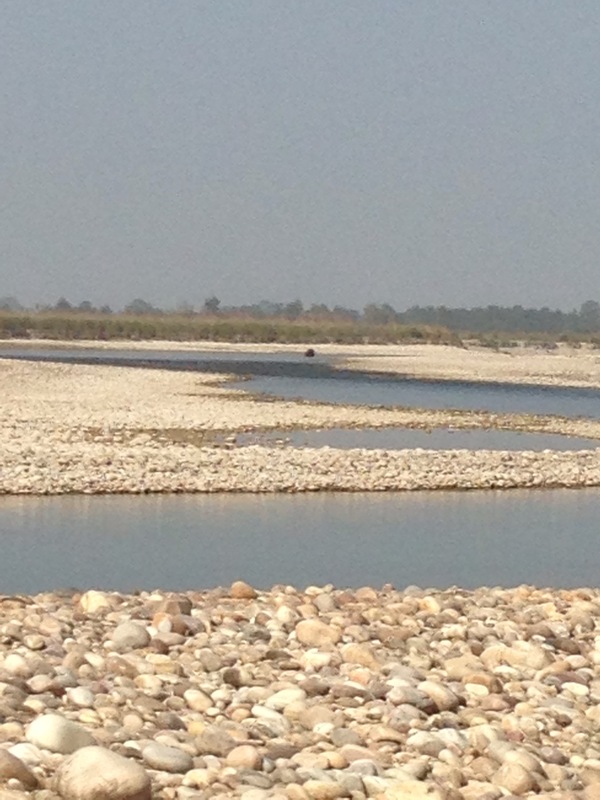 We were met by a jeep where the bus set us down at the turn off to Bardia. We huddled under a blanket as we bumped along the dirt track. It was still dark and very cold. Every bit of me wanted to sleep but the boys had slept well on the ‘party bus’. It was going to be a long day. We were staying at Forest Hideaway lodge. A series of ‘cottages’ based on the traditional Tharu mud and thatch dwellings but with ensuite Western bathrooms. These are set around picturesque gardens with tables and hammocks dotted around. We chucked our gear in our room and with a longing look at the bed went for breakfast. Our guide, Santos, introduced himself and we discussed our programme for the next few days. People usually want to rest when they first arrive but we had no chance of that with two young boys bouncing off the walls, so we agreed on going into the park on a jeep safari. We spent an enjoyable day roaming round the park. Bardia covers an area the size of London and we explored the equivalent of the West End in the jeep. During the course of the day we saw spotted deer, wild boar, monkeys (Macaque & Langur) crocodiles, lots different birds, and (very exciting for G and his current fascination with snakes) a python. Santos and Manu, our driver, tracked tiger prints and spoor and at various places we would pull up and follow these signs on foot. The boys were happy to spot spiders, bugs and butterflies. Towards the end of the day we swung by a look out point, there were a handful of other tourists with binoculars and big cameras focused on an area of bush across a small river. They were extremely quiet so we decided not to spoil the party with our noisy children. highlight of the day for the boys. Whilst there Santos got a call that another group from our hotel had seen a tiger at the look out point we had just left. We’d missed the bloody thing by 20 minutes! We had a lovely dal bhat dinner and enjoyed hearing from the lucky folk who had seen the tiger. Then we headed for bed. A firm mattress and soft pillow was a welcome combination and we all had a great night’s sleep! The following day we were up and out early for an elephant safari. 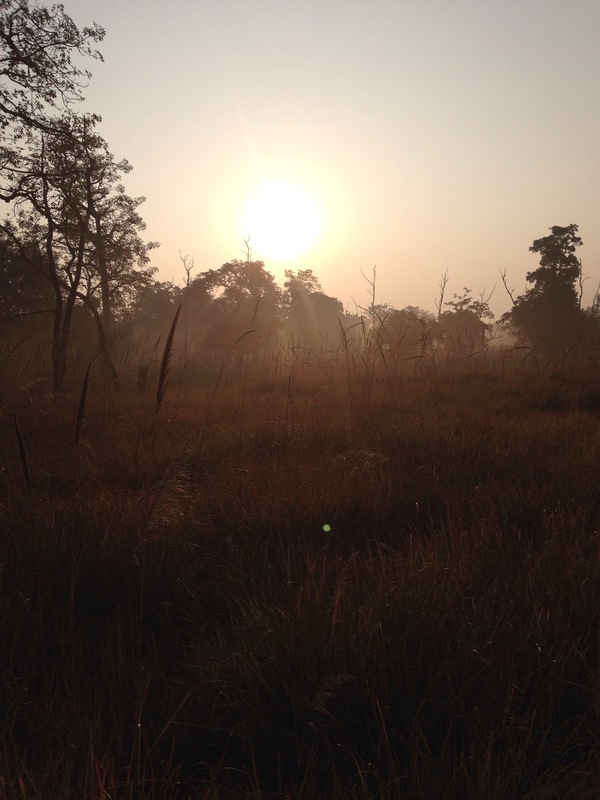 There was a beautiful sunrise and as the morning mist cleared we enjoyed the ride through the sun dappled forest. The mahout had a machete to hack off low hanging branches and Nick kept a keen eye out for webs containing massive spiders; he’s not a fan! 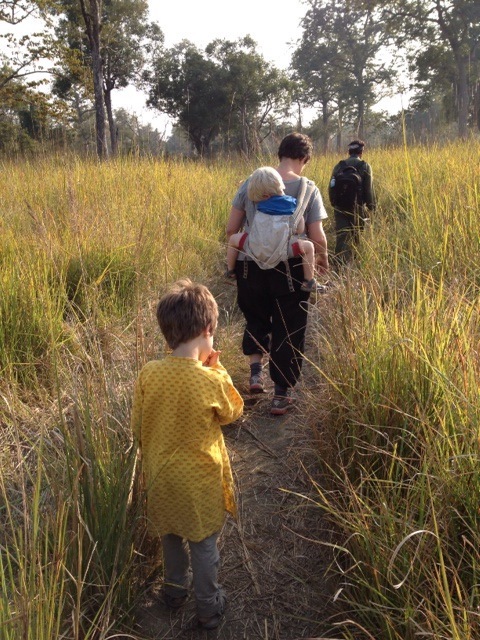 It was a very evocative experience, such a peaceful way to explore the forest and even the boys were quiet (apart from giggling at elephant farts!) 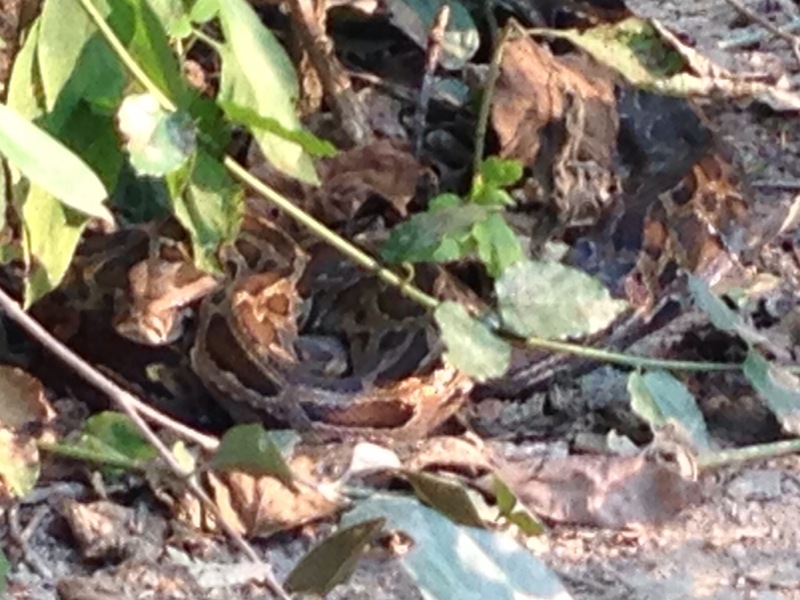 During the ride we saw another python as well as spotted deer and monkeys. The elephant*, Santi, seemed to bulldoze its way through the forest but the vegetation sprang back up behind us hiding its passage. I found it fascinating how something so large could walk through dense forest leaving little trace. The rest of the day was to be spent on foot. Santos and another guide, Nanu, lead the way. Walking through the thick elephant grass, listening for any sound, I had butterflies tickling my tummy with a familiar feeling of anticipation. The excitement I felt at the possibility of seeing animals in the wild stirred memories of safari trips in Uganda with my Dad and Sister. My mind wandered and I caught myself laughing out loud at the bad jokes – ‘look a crocodile, keep a straight face’ ‘ahh an elephant, and by the size of its ears I deduce that it is an African elephant’ and animal impersonations (if you know Catherine get her to do her buffalo – it’s uncanny). Walking along a dry riverbed with tall elephant grass on either side we had to be particularly quiet as to not startle the wildlife as there would be no means of escape from a charging animal. Santos had regaled us with stories of being chased by tigers and elephants and we understood the danger and importance of not drawing attention to ourselves. Happily George stayed quiet and Tomas was fast asleep on my back. In fact his snores were mistaken for a noise in the bush at one point which raised a giggle from me and Nick. We passed the place the tiger had been spotted the previous day then continued, across a river onto an island. We stopped for a couple of hours for lunch at a lovely spot overlooking a river. We didn’t see any animals there but the children were happy playing in the sand and Nick dosed in sun whilst I kept watch with binoculars. I’m not sure if my memory is playing tricks on me but I can’t recall all this waiting around from my trips to Queen Elizabeth National Park. Mind you I used to nod off in the jeep safe in the knowledge I’d be woken if anything exciting happened. Santos got a call that we’d missed a tiger again by about half an hour. I was beginning to think, that whilst there were trying hard to be quiet, the boys’ noise was scaring off all the wildlife. Then as we started to make our way back we saw it. 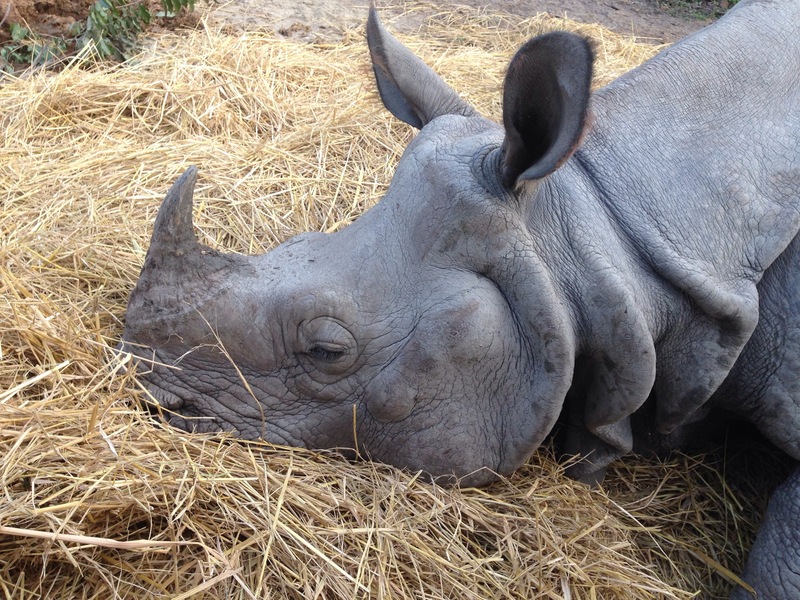 A one-horned rhino. It was a safe distance away (I wouldn’t want to be up close) and we had an excellent view through our binoculars. It was wading in river eating algae. It was a wonderful feeling to see this rare creature in its natural habitat. I cursed the Indian dust that has buggered the shutter on my SLR camera and took a feeble shot with my iPhone. When we got back the boys played with some children outside the lodge. I was happy to see them running around roaring after having to be still and quiet for so long. I was less happy about them joining in a game of chase with a dead rat. The next day was to be spent rafting on the Geruwa river. Santos asked if his family could join us. We figured the more the merrier and thought the boys would enjoy some young company. 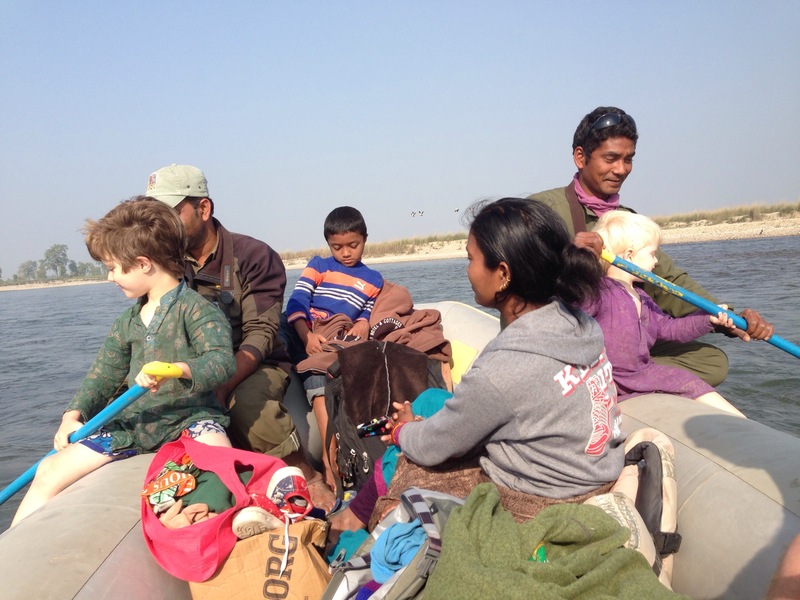 We collected his wife and two children (a boy, 6 and girl 2) from their home near the lodge and headed to our put in point at Chisopani. Our other guide for the day (whose name escapes me) was Santos’ brother-in-law so it was a real family outing! It was a sunny morning with an icy cold wind. The boys attracted the usual attention of local children whilst Santos inflated the raft. We also garnered disapproving looks from the grown ups at Tom’s (as ever) underdressed state. The water was crystal clear and happily the wind was behind us so it was pleasant to drift along the river. George has a deep affinity with water, (I’m sure he was a sea creature in a previous life) and he was desperate to get in. It reminded me of a time we visited a friend on her boat and instead of getting to meet her new baby I spent the time keeping G from flinging himself into the freezing water at Brighton Marina. He is older and wiser now and understood to wait until later in the day when it would be warmer. I enjoyed spending time with Santos’ family. Whilst his wife didn’t speak much English we were able to communicate a little. I delighted at her 2 year old daughters insistence on nursing and the ease with which she slept at the breast. It would definitely be a useful tool to still have up my sleeve (or top!) We also talked about the joys of a family bed and sibling squabbles over the duvet. Santos’ son was very quiet and still – the polar opposite of our own boys. 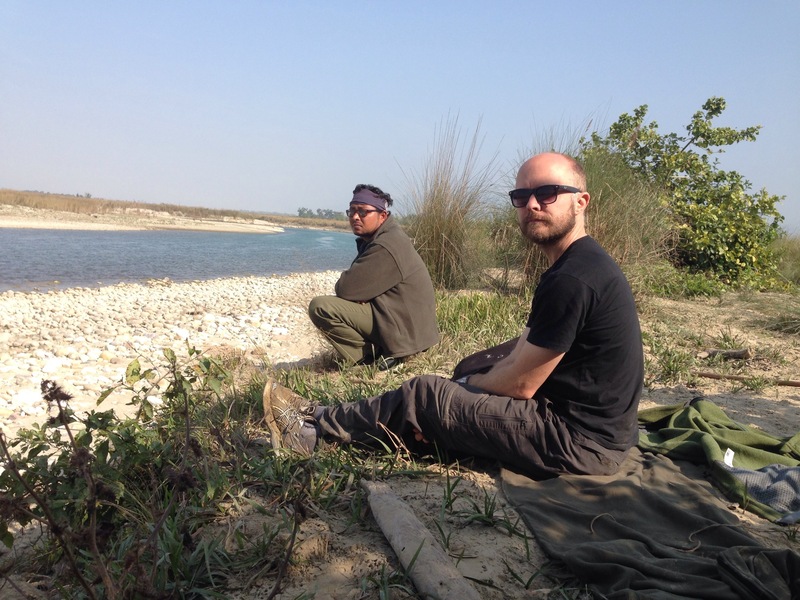 We stopped for lunch on a sand bar where rivers would join in the monsoon. Lovely peaceful spot, we still needed to be wary of wild animals and we saw plenty of footprints to demonstrate their existence but apart from a lone horned deer there was nothing about. 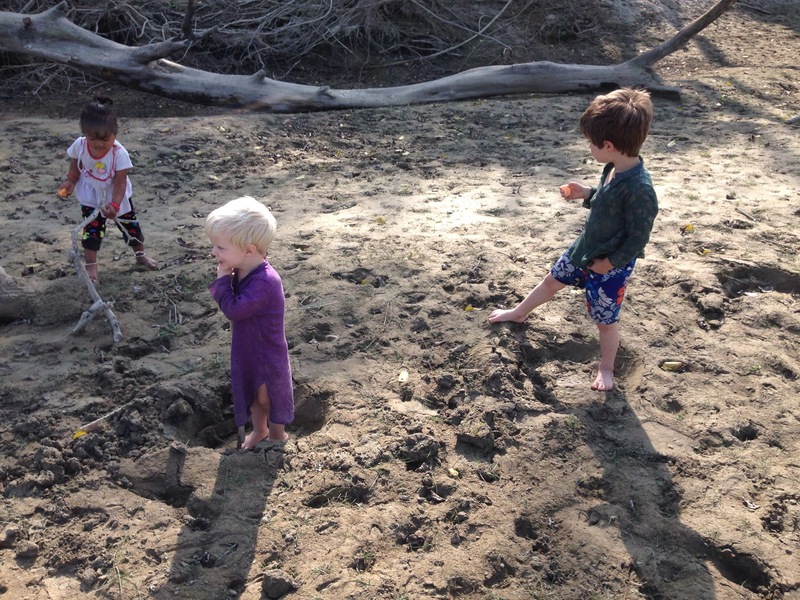 The children played in the sand and Nick dosed in the sun whilst I watched the bush with binoculars (I see a theme emerging). The rest of the afternoon was fairly uneventful. George finally got his dip in the chilly water and was joined by Tom and Nick but they didn’t stay in long. We enjoyed the thrill of rushing through some rapids (very mild ones that probably don’t even get on the white water scale). In other places the water level was very low and a couple of times Nick and the guides jumped out to give us a push. Santos said that they’d manage one more raft trip the next day and that would be it until the spring snow melts swell the river again. We saw elephants on the river bank (and from the size of their ears I deduced that they were Asian elephants) but they turned out to be domestic elephants in the park to graze. We also saw lots of birds including kingfisher, osprey and vulture. When we stopped for the day the boys’ shoes were nowhere to be found. We seem to be getting through shoes at an alarming rate. In two months we have lost 1 croc, 1 Birkenstock, 1 pair of flip flops and now two pairs of sandals. That evening we were entertained by a cultural dance. I tend to steer clear of this kind of thing at hotels but this was in fact a load of local teens having fun. Nick, Tomas and I joined in as well as the handful of other guests. George however was more interested in his desert. We were due to leave the next afternoon so in the morning we wandered down to the local market to find shoes for the boys. 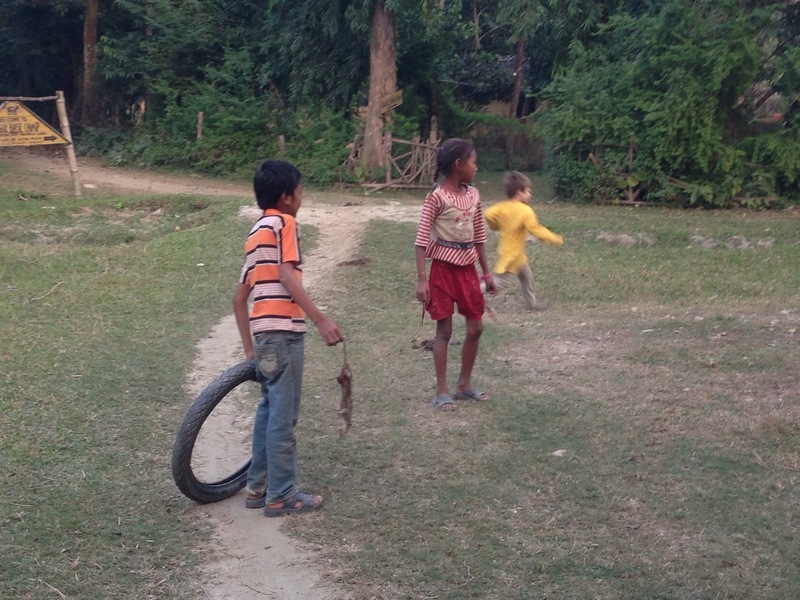 It was a pleasant walk through a traditional Tharu village. The houses are made from a mixture of mud and dung spread over a wooden frame. Many houses had chickens, goats or buffalo and there were pumpkin patches on the roofs of the cowsheds. A waiter from the lodge had come with us to point us in the right direction and he delighted in introducing us to his extended family along the way. At one point we terrified a poor toddler who had never seen a Westerner before. We happily greeted some of the dancers from the previous evening as we passed them on their way to school. 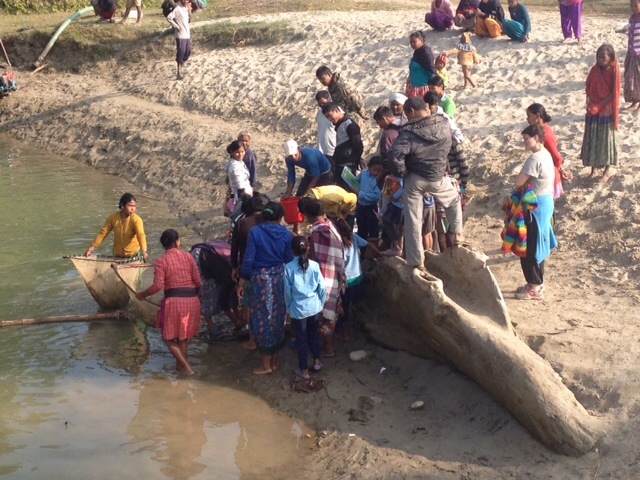 On the way back we stopped to watch the women of the village working in the river. The water level was low and by making a series of dams they had pushed fish, eels and crabs along and then caught them in big nets. The boys were fascinated and we spent a long time there whilst they helped sort the catch into different buckets. Which were then shared amongst the women. George was given a fish and was most upset that we wouldn’t let him keep it to play with on the 14 hour bus ride. And with that our visit to Bardia was over and we braced ourselves for all the fun of the nightbus back to Pokhara. We may still have not seen a Bengal tiger but we really enjoyed our time exploring the park. It was peaceful, beautiful and a wonderful way to spend a few days. *Santi appeared well treated and low visitor numbers at Bardia mean she is not over worked but I have since learned more about how elephants are trained and am left feeling deeply uncomfortable. I love the Barking Deer particularly as Nik was born in Barking Hospital ! The rat made me lol. Amazing to see a Rhino in the wild. What a sight. People are so facinated with clear pictures but to see something like that in the wild is such a privilege.